It was about five years ago that I first had this dish, I was in New York visiting my friend Nick and we went to Planet Thai, which is in Williamsburg Brooklyn. I thought the ginger chicken sounded good so I ordered it and immediately fell in love. When I got home I was on a mission to make this dish just like the restaurant and after many recipes, and lots of messing around with ingredients this is what I came up with. I need to make this dish more often because it is really healthy and super quick to prepare. 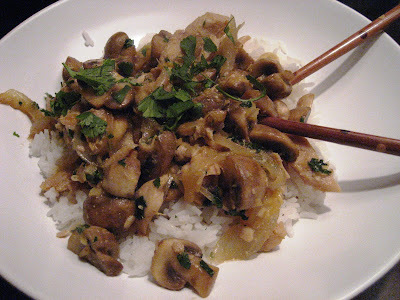 I like to serve this with jasmine rice, but it’s good with any type of rice so just make whatever you have on hand. Heat oil over high heat in wok or heavy bottomed frying pan until almost smoking. Add chicken and cook until almost cooked through, 3-4 minutes, next add onions garlic and ginger and cook until onions just start to wilt, about 3 minutes more, then add mushrooms and cook until tender. Add all other ingredients and stir to combine, continue to cook until sauce comes to a boil and thickens slightly, a few more minutes. Add a handful of chopped cilantro and serve over a bed of rice with a sprinkling of cilantro over top of entire dish.